It was not quite 10 years ago (Feb 2006) when H5N1 first arrived in France, presumably carried in on the wings of migratory birds, and during 2006-2007 it sparked several dozen relatively small outbreaks in poultry. As with the rest of Europe, H5N1 in France was relatively quickly contained, and their last reported outbreak was in August of 2007. 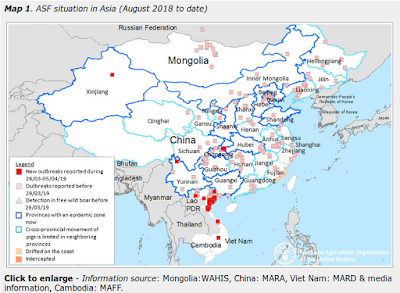 During H5N1’s great diaspora of 2005-2006 the virus quickly spread from a handful of Asian nations into more than 60 countries, including much of Europe and Western Africa. After what seemed like an unstoppable advance we saw an unexplained retraction of the virus around the world, with H5N1 settling into a handful of `hotspot’ countries (Indonesia, Egypt, Bangladesh, India, etc.). By 2012, the number of countries reporting H5N1 had dropped back down to 15. But over the past year we’ve seen a resurgence of H5N1 around world at the same time that H5N8, H5N2, and H5N6 have taken off. Combined – and when you add in today’s report , these HPAI H5 viruses have struck 35 countries in 2015 – the largest number reported since 2007 (which also saw 35 countries hit). After an absence of anywhere between 5 to 9 years, we’ve seen H5N1 return to West African and European countries like Nigeria, Ghana, Burkina Faso, Hungary, Bulgaria and and now France. The following report of the detection of HPAI H5N1 in France was published by the French Ministry of Agriculture this morning. While just a backyard flock, this should serve as fair warning to European poultry interests that H5N1 has returned for the winter. A case of avian influenza has been confirmed in a backyard in Dordogne, following an abnormal mortality has immediately led to the taking of samples for analysis by the Departmental Directorate of protecting populations. The confirmation of cases of avian influenza has been established on the evening of Tuesday, November 24 by the National Agency Risk Assessment (Anses) and strain of the virus was identified. This is a highly pathogenic H5N1 in poultry. The sequencing of the strain is underway but it seems to be of a strain already detected in Europe, which until then had an LPAI profile. Stéphane LE FOLL, Minister of agriculture, food and forestry, Spokesperson of the Government, immediately instructed his services to enable the national health emergency response plan in accordance with European rules and International. Thus, protection zones and surveillance of 3 km and 10 km respectively livestock are implemented. Monitoring will be strengthened not only in farming but also in wildlife. The Minister in charge of agriculture, Stéphane LE FOLL, in conjunction with the Minister in charge of health, Marisol Touraine will also enter the ANSES, as a precaution, to assess the potential danger of the strain for 'man. Finally, Stéphane Le Foll asked the Director General to convene an emergency supply National Guidance Committee of animal health policy Thursday, 26 November to mobilize all stakeholders and to ensure the application immediate measures of protection and management against avian influenza. The speed of the implementation of management measures is a prerequisite to limit the spread and consequences of disease, especially for export. Stéphane Le Foll reaffirmed total mobilization of the state and its services alongside professionals.